What can the politics of ethnic Russians in Georgia tell us about the country’s attempt to build a truly civic national identity? The Georgian-Russian friendship monument before the Jvari Pass. It was constructed in 1983, to commemorate the bicentennial of the Treaty of Georgievsk, whereby the Kingdom of Kartli-Kakheti became a protectorate of the Russian Empire (and was eventually annexed in 1801). Photo (c): Maxim EdwardsGeorgia’s most recent population census released in April 2016 reports that ethnic Russians constitute the third largest national minority behind Azerbaijanis and Armenians, totaling 26,500 persons. Yet Russians appear to occupy a peculiar place in the imaginary of Georgia’s ethnic and religious diversity. Given the Russo-Georgian War of 2008 and Moscow’s support for breakaway Abkhazia and South Ossetia, that’s no surprise. 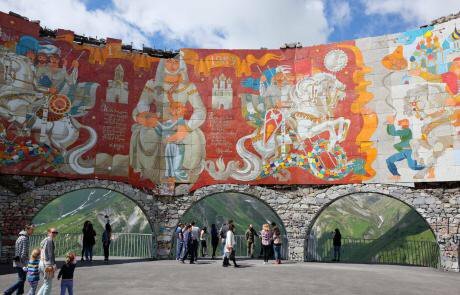 Ethnic Russians have lived on Georgian territory for centuries — but do they have a place in Georgian society beyond agents of geopolitical intrigue? Can they ever hope to? This results from two major population movements: the arrival of banished sectarian groups such as Dukhobors and Molokans to the South Caucasus, as well as Cossack military settlers in the 19th century. Later years saw the mass migration of workers to supply the steel-producing industries in cities such as Rustavi in the 1940s and 1950s. At least in theory, this community’s needs and interests continue to be represented by approximately 25 NGOs—the most prominent of which include “Yaroslavna” Union of Russian Women of Georgia, Union of Russian Youth of Georgia, International Cultural-Educational Union "Russian Klub” (whose director Nikolai Sventitski also manages Tbilisi's Griboedov State Drama Theatre), and Center for Legal Protection of Russian Compatriots in Georgia—which are distributed nationally and headed by the umbrella “Otchizna” (Fatherland) Union of Russian Compatriots of Georgia and its longtime president, Valery Svarchuk. Many senior community leaders also hold dual Russian and Georgian citizenship, which though technically illegal, is generally tolerated by authorities. While as in the case of other minorities their numbers have declined drastically (by at least 60%) since independence, the situation of ethnic Russians is relevant given that Georgia is the only former Soviet republic — including even post-Euromaidan Ukraine — to sever diplomatic relations with Moscow following the 2008 South Ossetia War. Tbilisi has also replaced Russian with English as the second official language and initiated projects such as the Museum of Soviet Occupation and the Georgian Truth Commission to reassess the history of interactions between Georgian and Russian societies during the past decade. What impact, if any, have these conditions had on that proportion of citizenry that self-identify as Russian or continue to embrace Russian language and traditions? Some in Georgia's prevailing political and intellectual elites seem to deny the existence of ethnic Russians altogether. A recent article authored by Eka Metreveli, director of the Georgian Foundation for International and Strategic Studies (GFSIS), states emphatically that “Technically speaking, Russia is not a kin-state to any minority residing on Georgia’s territory”. In June 2015, staff of the United National Movement’s Batumi office [the ruling party of former president Mikheil Saakashvili - ed.] posted a Facebook video of a public procession organized by the local multiethnic cultural center Friendship House in recognition of Russia Day, a holiday celebrated by the diaspora in many countries, with the ominous line: “Russian march and shouting in the streets of Batumi”, as if it were led by an infiltration force, rather than fellow Georgian citizens. On the one hand, these denials may simply reflect political expedience. Acknowledging the presence of naturalised or native-born ethnic Russians in Georgia might risk lending credence to the “compatriots policy” introduced by the Russian government in recent years to justify intervention in defense of its kin — ambiguously defined by ethnicity, citizenship or language — in the near abroad. The Kremlin has employed this to literal effect in its annexation of Crimea and sponsorship of the insurgency in (and invasion of) eastern Ukraine. Yet, these attitudes are not limited to Georgian public figures. They also extend to foreign scholars who are often invested ideologically in advancing the cause of western integration in the South Caucasus region. 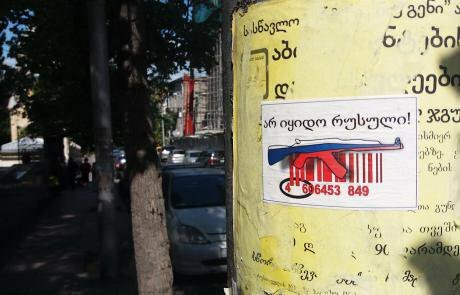 “Don’t buy Russian [products]!” reads this sticker near Tbilisi’s Rustaveli Avenue. Photo (c): Maxim EdwardsFor instance, at a workshop on Georgian politics I attended at Uppsala Centre for Russian and Eurasian Studies (UCRS) in December 2015, a prominent young specialist, whose dissertation research examined language education policies implemented by Mikheil Saakashvili’s government in the country’s Armenian and Azerbaijani-populated regions from 2004-2012, was visibly bewildered by the suggestion that NGOs representing ethnic Russians were present in Georgia, let alone of any significance. This reaction might also be attributed to the saturation of discourses that accompanied the civil integration reforms pursued by Saakashvili’s UNM during its near decade in power. These discourses suggested that, given the inherently European foundations of Georgian society and culture, it was Russian manipulation rather than Georgian ethno-nationalism that fueled the civil conflicts and secessionist wars of the early 1990s, while Soviet legacies and Russian influence are responsible for all instances of intolerance, xenophobia and extremism in contemporary Georgia. This dismissive pattern can be further traced to the earlier generation of government-affiliated think tank products on the question of “Russian soft power” in Georgia, long before it became de rigeur in national security circles in the wake of the 2014 Ukraine crisis. For example, a report published in 2010 by the Tbilisi-based International Center for Geopolitical Studies (ICGS) cites the 2009 annual speech on diaspora affairs by Valery Svarchuk, president of the “Otchizna” NGO. Here, Svarchuk addressed the negative impact of the suspension of diplomatic relations (which disrupted voluntary resettlement and cut off financial support previously received from the Embassy of the Russian Federation) and de-Russification trends in the public education system on Georgia’s ethnic Russian community, characterising “some of these organisations” as “trying to portray a distorted picture of the actual situation, often repeating the Kremlin rhetoric”. Thus, no distinction is made between criticism by minorities of policies that affect them, and promoting the interests of a hostile foreign power. In the post-Saakashvili era, a similar logic has been applied to a series of interest groups such as Eurasia Institute, Irakli II Society, Earth is Our Home, the coalition Eurasian Choice, and Georgian Peace Committee, the majority of which were registered in the years following the 2008 war, that advocate reconciliation or restoration of fraternal ties with Moscow. A cottage industry of articles by foreign commentators, opposition-affiliated journalists and political analysts have identified these organisations (in defiance of readily available evidence) as sudden and unambiguous creations of the Russian intelligence services deployed in Georgia to conduct “information campaigns”, or attribute their origins to the ascendance of Georgian Dream party founder Bidzina Ivanishvili in the 2012 parliamentary election. Yet, a common theme that runs throughout the platforms of these groups is their antagonism towards the radical westernisation policies pursued since the 2003 Rose Revolution, which have sought to rapidly transform the country's social, cultural and economic landscape in the image of foreign patrons—a vision not shared by all members of Georgian society. In addition, some of these advocacy groups interact with long-established communal organisations that represent the interests of citizens whose preferences and perspectives have been marginalised by Georgian state forces in previous years. For instance: Earth is Our Home, whose chairman Elguja Khodeli gained infamy in local media for wrapping himself in a Russian flag at a demonstration during the Crimea events, was actually founded as a youth and lawyers' advocacy group in March 2003, and includes representatives of the Russian, Jewish and Azerbaijani communities. Among the activities of Earth is Our Home have been artistic performances to commemorate the birthday of Alexander Pushkin at his monument in central Tbilisi, cooperating with the local “Prima” music school to promote the study of Russian folklore, and roundtables with educators on prospects for restoration of Russian language sectors in Georgian schools. The Russian Orthodox church of St John the Theologian, completed in 1901. Located in the Vere district of Tbilisi, it stands beside the historic Georgian Orthodox Lurji Monastery. Photo (c): Maxim Edwards.These activities suggest that rather than being sinister appendages of the Kremlin apparat, such actors occupy the same social space as other obscure, underfunded NGOs that perform little-recognised cultural, educational, and humanitarian functions. These are exemplified by Russian and Greek language courses and documentary film showings on the 1915 Armenian Genocide jointly organised by the Irakli II Society, Union of Greek Communities of Georgia and Assembly of Armenians of Tbilisi (which also participates in Eurasian Choice), and charity events for International Children’s Day, Week of Russian Language in Georgia and lectures on disease management and health care provision in the regions co-sponsored by Earth is Our Home, “Yaroslavna”, Union of Russian Youth, Center for Legal Protection of Russian Compatriots and even the “Diabetikon” Union of Diabetes Sufferers. It would be a mistake to directly conflate this crop of “pro-Russian” NGOs which received disproportionate media attention in 2014 and 2015 with Georgia’s ethnic Russian community organisations as a whole. Those interactions which do occur appear to have been by virtue of their both civil society actors that disagree with anti-Russian elites, not because they are necessarily identical. In contrast, Georgia’s “patriotic” activist NGOs such as Free Zone (Tavisupali Zona), established in 2013 by former UNM MP Koba Khabazi to agitate against the Georgian Dream government (which it regards as a “Russian collaborationist regime”), have relied upon tactics of physical confrontation and vandalism directed toward any targets it identifies as “pro-Russian”, which would seem to deviate from the European norms of tolerance and inclusion professed by their founders. In May 2015, in response to a rumour spread via social networks alleging plans by the Moscow-based Night Wolves motorcycle club to attend the Day of Victory over Fascism ceremonies in Tbilisi's Vake Park, Free Zone members engaged in a weekend-long campaign of tampering with vehicles owned by Russian tourists, staged scuffles with Georgian diasporans and motorcyclists visiting from Russia in Tbilisi and Gori, and harassment of individuals wearing the Ribbon of St George under the pretense promoted by allied press outlets that it was “invented by Vladimir Putin in 2006 and has nothing to do with World War II”. Its true historical significance is however more complex, as it was first introduced by Catherine the Great in the 18th century and banned by the Bolsheviks, later being rehabilitated by Josef Stalin for use in Soviet World War II medals. Representatives of the ethnic Russian community who traditionally attend the event were reportedly informed of these intended actions in advance, and requested that members of Earth is Our Home serve as bodyguards in ensuing clashes between Free Zone and youths from their organisations. An incident in September 2015 at the privately-funded Intellect Russian language school in Tbilisi, which was attached to the former military hospital of the Russian Armed Forces and also serves the families of Ukrainian, Armenian and other minorities, further demonstrates these contradictions. In a video filmed by Free Zone and posted on their official website, members are shown entering the premises and confronting the principal Orest Peschanenko regarding geography atlases purchased by parents of students from the Moscow-based Ventana-Graf publishing house, which contain maps that portray Crimea as a subject of the Russian Federation and Abkhazia and South Ossetia as independent republics. Despite the principal’s explanation that the wrong items had been delivered due to a supplier error and were withdrawn pending a refund of fees, after tearing of pages and repeated accusations of treason and “GRU agent” he contacted the police, eventually (possibly out of fear) giving permission to destroy the books, which were shredded and placed in a pile in the school parking lot. Ironically, earlier analyses that identify claims of “persecution” of Russian language in Georgia as Kremlin propaganda tout the Saakashvili government's positive role in helping the Intellect school to remain operational after diplomatic relations were suspended in 2008. “This is my land! 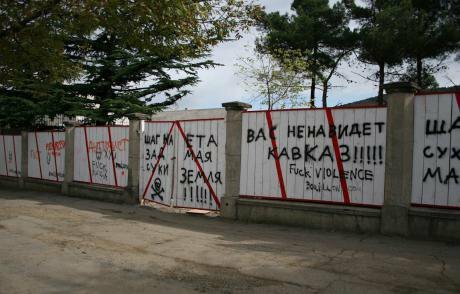 The Caucasus hates you!” Graffiti on the gates of the Russian Embassy in Tbilisi, two months after the 2008 Russo-Georgian war. Photo CC-by-SA-2.0: Gavin / Flickr. Some rights reserved.A particularly virulent strain of doublethink is presented by the “information warfare” portal InformNapalm operated by Ukrainian and Georgian partisans in the Donbas conflict, who have also written for Euromaidan Press, which purports to champion minority rights. This once again denies the hostility toward ethnic Russian and Russophone minorities – an important feature of extremist political movements in Georgia's post-independence history. Today, mainstream Georgian academics themselves acknowledge this perception of national minorities as a fifth column of Russian “occupiers”, and that ethnic Russians were themselves included in that equation. It seems that Russian ethnic and cultural associations occupy a highly ambiguous position within Georgia's volatile transitional climate. This position is reflected in the equally inconsistent reactions of societal elites: from dismissing community concerns about the impact of hostilities with their kin state as willful distortion, to negating their status as a diaspora altogether. Consequently, Georgia’s Russian communal organisations become implicated by societal elites in the policies of the Russian government in unresolved regional conflicts. The curious case of Georgia’s ethnic Russians could indicate a deeper malaise. Perhaps their story is that the civic nationalism project pursued by various governments in post-Saakashvili Georgia is essentially incomplete. But more worrying still, perhaps it brings to light an enduring separation between Georgia’s ideological, technocratic leadership and the popular terrain that they seek to transform.